I’ve talked a lot about branding in the last weeks and one of my favorite people, Gregory Stringer, asked me to talk about co-branding, so here goes. Many brands use a co-branding strategy, like Cinnabon and Carvel. Think about a few you’ve seen recently. So, what is co-branding anyway? A marketing partnership between at least two different brands of goods or services. Cobranding encompasses several different types of branding partnerships, such as sponsorships. This strategy typically associates the brands of at least two companies with a specific good or service. A basic definition doesn’t really tell you much about co-branding strategy. Let’s take a look at the pluses and minuses of using a co-branding strategy for your brand. Co-branding is particularly valuable as a means to create a positive image in the minds of folks who might not know much or anything about your brand — it gives you warm fuzzies about the lesser known brand. If you’re a younger child, you already experienced how co-branding works. Remember when you went to school and people, especially teachers, expected you to act a certain way because of your older sibling? That’s how co-branding works — you expect certain characteristics and behavior from a brand based on the associated brand. 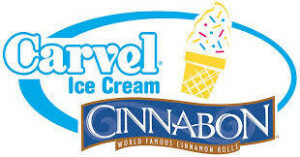 Just like in the image that opened this post — you know and love the rich, cinnamon taste of Cinnabon and you transfer that positive image to Carvel. The Intel partnership with PC manufacturers [Intel Inside] introduced a branded chip that, in its heyday, commanded a 2000 percent markup for the chip maker and created a loyal following that made the market unappealing for new chip manufacturers for many years until AMD came along to challenge the more established Intel. Co-branding is also a way to create a positive brand image by transferring emotions related to one brand to the other. For instance, the partnership between Michael Jordan and Nike that made his branded shoes so popular folks stood in line for the chance to own part of the legend. Michael’s cache and athletic prowess created a cult following and led to consumers collecting his shoes, even if they didn’t wear them. There’s a certain economy of scale that makes sense when you’re looking to get the most bang for your buck. Combining advertising efforts, co-locating operations, even collaborating on digital marketing programs makes sense in some situations. Probably the biggest danger is the vulnerability caused by reliance on two brands — if something terrible happens to one brand, both brands might suffer declining market performance. This is the same reason why some companies don’t use a family branding strategy, instead preferring separate branding for each product line — like Proctor and Gamble with Tide, Cheer, Gain, and others just within the laundry detergent market. Damage to one brand might bring down both brands. Another danger to a co-branding strategy comes from loss of control and burgeoning bureaucracy to manage the efforts that cause a certain frigidity and slow down strategic responses. Image, for example, you are co-branding with a local firm and that firm does its own advertising. How do you manage that interrelationship. Car manufacturers struggled with just this problem in their relationship and reliance on local dealerships to sell their product. Often, the local dealer advertising damaged the brand image the manufacturer wanted for the automobile. Over time, manufacturers controlled the situation by requiring dealerships adhere to their communication rules, which slows down the advertising process and might damage a working relationship between the two. Look for partners who share your core values. This helps ease concerns regarding damage to your brand from the missteps of your partner. Partner with products representing “best in class” products. Retain the rights to review and approve all communications before they’re released. Of course, I can add my own advice to this. For instance, I think your strategic partner should offer something valuable that would be too expensive or time-consuming to do on your own. Over time, they might benefit more from your alliance than you do, so take a long-term approach when evaluating what you’re getting and what you’re giving to the co-branding effort. For instance, over time, Intel became more of a selling point for the PC industry than the other way around. Second, clearly understand how consumers view each brand individually. Make sure you partner with firms where there’s a symmetry in these brand images — where they fit together to form a nice package rather than fight each other in consumers’ minds. Are elements of a co-branding strategy different in the digital age? In addition to the types of co-branding mentioned before, I think you can talk about using influencers to co-brand your product by reaching out to folks who have a stellar reputation in your business vertical and soliciting their support for your brand by writing a review, sharing content, or doing a guest post on your blog. Such collaborations, when authentic and genuine give consumers insights into your brand and form a positive brand image. And, influencers don’t have to be paid or formal. Facebook sponsored posts can be valuable in co-branding by showing which of your friends “liked” the brand. Similarly, collaborating with certain tools lends credibility to your brand. For instance, I tout my Google certifications in Analytics and Adwords to potential clients to show I’ve attained a certain level of expertise in these key areas of digital marketing. I mention branding analytics or content marketing products I use to show the caliber of work you can expect from my agency. As a firm seeking to develop your brand personality and support your reputation, publishing on high-profile blogs or speaking at certain events is key. Posting clients or where your work appears online acts to co-brand your product with these more established brands.